They walked, giggled, and walked some more. Just three girls with Prader-Willi Syndrome. Three girls with hypotonia, ignoring their weak muscle tone as they made their way from pirate ships to dinocars and back again, up and down hilly, hilly paths. 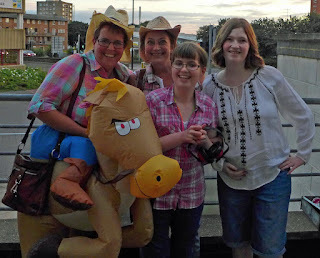 It had been a logistical feat to get my daughter up north for the theme park trip, organised for a PWS buddy’s birthday. We’d stayed with family the night before after a three hour car journey. My husband was working so I had my little boy with me, too, which meant I’d decided to taxi my girl to and from her friend’s house and not accompany the group, as I didn’t think she'd want her brother cramping her style. In any case, the crack squad of two PWS mums were enough to deal with the three girls (and one little sister). If they’re reading this and swearing at me, I’m sorry, all right? (I’m not, really). Instead, I kept the little lad happy with a trip to a zoo and a Pokemon hunt. I made a woman spit out her drink in a wine bar in Uppermill, when my son caught a Pidgey and I told him with a serious face that wine bars and pubs were obviously excellent venues for Mummy, Auntie Jill and Uncle Kevin to hang around in in order to help him catch more Pokemon, and we should visit some more. My girl slept a deep, happy, exhausted sleep. I think the two PWS mums did too. Apparently, those hills really were hilly. I’ve just taken off my Bernie Clifton-stye inflatable horse costume, and I feel like I’ve let myself down. Come on, it’s late, everyone’s in bed, I’m a little bit woozy on diet cokes and happy endorphins, and I had to tell my joke somewhere. 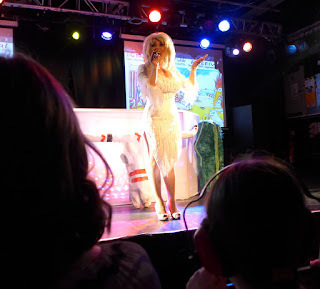 Me and my girl attended a special gig tonight. It was a Rockin’ Roadrunner Nightclub night in Northampton - a gig organised with and run for young people and adults with a range of disabilities. 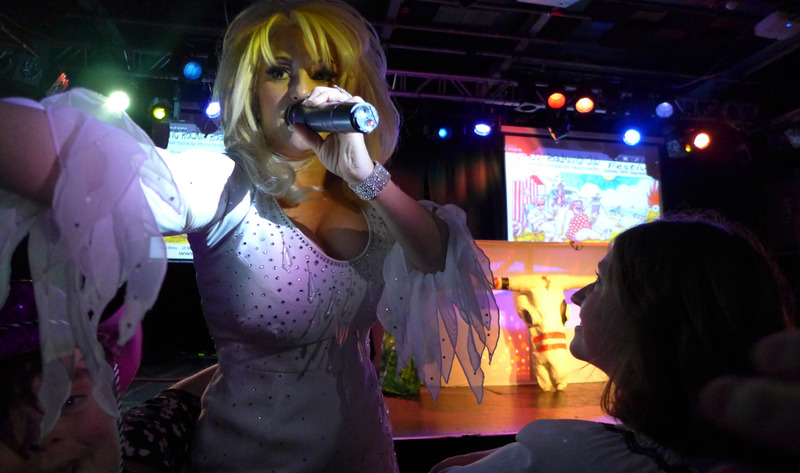 Star of the show was bazooka-bosomed Dolly Parton tribute act Kelly O’Brien. We went with my daughter’s Prader-Willi Syndrome Best Friend Forever (PWSBFF) and the friend’s frankly-she’s-a-bad-influence-on-me mum. After a voucher-funded Pizza Express meal for four (discounted to the princely sum of £9), we hit the venue, I hit the loos and donned my battery-driven rodeo outfit, and we all hit the dancefloor. It was a beautiful night. Dolly/Kelly was fantastic, interacting wonderfully with the eccentric and enthusiastic crowd. My girl, with her checked shirt on, and her red ear defenders, sang along happily to ‘Jolene’ and ‘9 To 5’, and I discovered all kinds of new, inflatably driven dance floor moves. 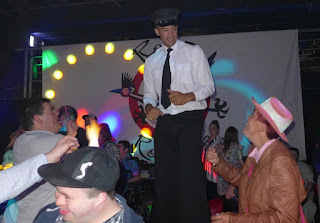 A special needs crowd need no encouragement whatsoever to whoop it up in an almighty manner. My daughter, confronted by the sight of two 12ft tall 'security guards' (very entertaining stiltwalkers who were part of the show), will still actually believe they were randomly tall policemen, despite any logical explanations you make in an attempt to convince her otherwise. If you’re wearing an inflatable horse, people want to hug both you and the horse. Also, it takes exactly the length of ‘I Will Always Love You’ to negotiate going to the toilet, and it’s really not a good idea to re-inflate before you get out of the cubicle. You can really fit an awful lot of joy in one place. The next Rockin' Roadrunner Club event is the free Seaside Festival music festival at Abington Park, Northampton, on Sunday 18 September. More details from their website, here. I can’t get into my daughter’s head. I stop and wonder sometimes about her perceptions of herself, the world around her, and her place in it. Sometimes I get a peep inside. A little flash. It came this week in the form of a letter. The background to it is that she’s been doing one morning a week work experience at a health spa. Her school’s work experience co-ordinator sent me an update. I read it out to my girl and she was pleased, really pleased with herself. I’ve read it a few times, and it’s the final sentence, it’s always the final sentence. That’s what gets me. The choice of words and what they mean. Song is Buzzcocks - Real World. Inexplicably set to images of birds. It was going really well. My daughter’s 15 inch scar on her back from where she had her spinal surgery just a few weeks ago had healed up nicely. That was until the other night, when I went out to play rounders (I’ll tell you another time about how cathartic smacking the hell out of a ball with a wooden bat is). My husband was on nights, so my mum had agreed to babysit for a couple of hours. The i-word is not usually a welcome one, and it proved true to form. My daughter had picked her scar. She’d got blood all over her nightie, all over the bedsheets, and had opened up some of the healed up areas of skin. A helpful voice piped up from my boy's bedroom. "Most importantly, Mum, she's picked the bottom part where it took longest to get better, Mum. Most importantly, you know. Most importantly." God, he loves it when she's in trouble. I cleaned and patched up my girl and then had a bit of a rant at her. I felt bad afterwards - a tendency to skin-pick is a common problem with Prader-Willi Syndrome, and later I thought about that urge, and how itchy and tempting a big healing scar must be. We booked in with the nurse at the GP’s surgery (who just signed her off the week before), and we’re back putting dressings on for a few days. I’ve cut my girl’s nails short. 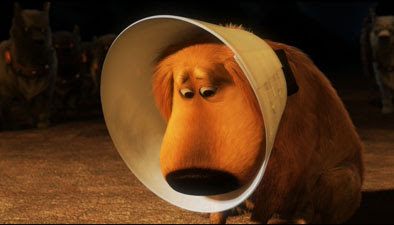 A friend has offered me two ‘cone of shame’ protective dog collars to put round my daughter’s hands. I almost considered accepting.